I've seen several Mighty Quinn's Barbeque restaurants while walking but never had a chance to try the famous BBQ chain. On the Independence Day, we decided to visit Upper East Side restaurant instead of the original East Village because I was concerned about the traffic or street closure due to the fireworks, but we later regretted this decision. We got there at 6 PM and there're about 15 people in a line before us. I thought it's a full-service dining but apparently it's self-service; you order while standing, pay, then grab a seat. They measure the meat by placing a metal plate with sliced meat, then next stuff prepare side dishes you choose. I got Brisket and Mac N' Cheese. The staff sprinkled coarse salt after slicing the meat. They're tender, juicy and lightly seasoned but not particularly well-seasoned or smoked. I tasted salt more to be honest. The cucumbers were "pickles" but they tasted like kneaded with salt, and they didn't have any sourness. BBQ sauce was in a large bottle on the table, and the sauce added sweet, salty, lightly sour and peppery flavors to the brisket. The brown objects seemed to be bacon but I think they're just cheese baked on the top. It's very salty and had intense rosemary scent, and I didn't like it at all. It's cold, too, and the cheese was crumbling and the texture was weird. My husband got Crispy Chicken Sandwich with honey chile. 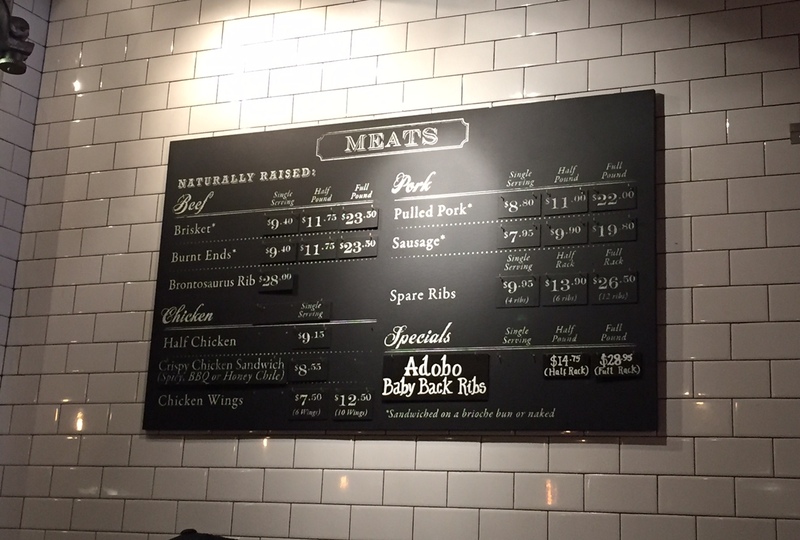 When he ordered it at the "meat station," the staff used a walkie-talkie and sent the order to the kitchen, and when it's ready, the sandwich in the box was put on the metal plate with my brisket. Thus, it WAS hot at that moment, but by the time we sat, it GOT cold sadly. The chicken breast was fried to crispy but it's not really seasoned so that the sauce (honey chile) was the only flavor we found. 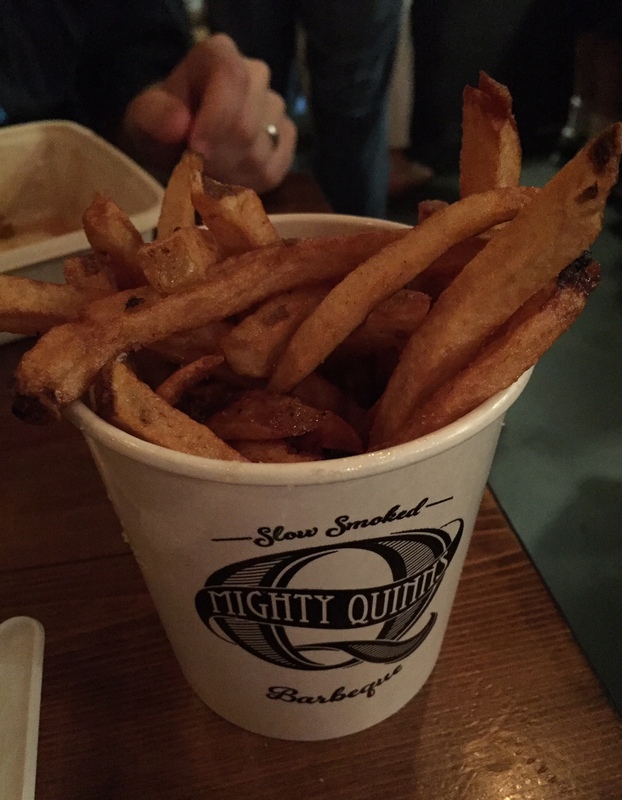 They're slightly thick fries and brought by a staff from the kitchen. It looked like they only have one size for the fries. They're supposed to be freshly fried but not hot-hot at all. 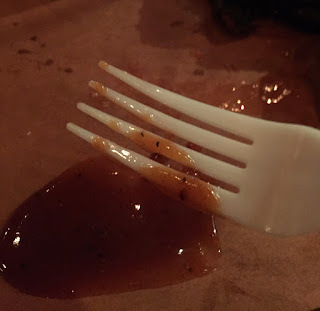 It took them more than 10 minutes to get us food (meat and side) after they sliced the brisket, and by the time we sat at a table, everything was cold or lukewarm, which wasn't pleasant and disappointing. Also, Pommes Frites, one of the simplest items, was brought to our table another 10 minutes later. I thought they're pricey for the portion and quality, the food that should be warm was cold and they're not even that tasty. My expectation must have been too high as the taste and service didn't exceed or even meet my hope. 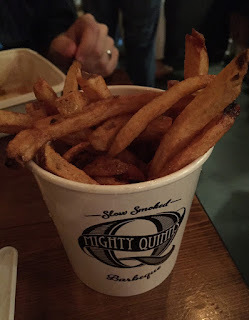 Reviews on the internet said UES isn't good but East Village had much better comments, besides our friend said East Village was quite good, so next time we (ever) decide to have BBQ at Mighty Quinn, we're going to East Village.